If you’re looking for a new way and a new story to celebrate Black History Month with your family, read The Promise with your children this month. 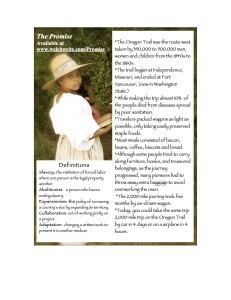 The Promise is based on the true story of an enslaved family that traveled the Oregon Trail in search of freedom. Their owner promised them freedom if they helped his family make the move – but then went back on his promise when his financial fortunes sank during the trip. It took a nice Quaker family and an abolitionist-leaning judge to make that “promise” a reality. It’s time for a new story. It’s time to share The Promise with your young family. Share this amazing story with your friends and family today! Slavery: the institution of forced labor where one person is the legal property another. Abolitionist: a person who favors ending slavery. Expansionism: the policy of increasing a country’s size by expanding its territory. Collaboration: act of working jointly on a project. Adaptation: changing a written work to present it in another medium. 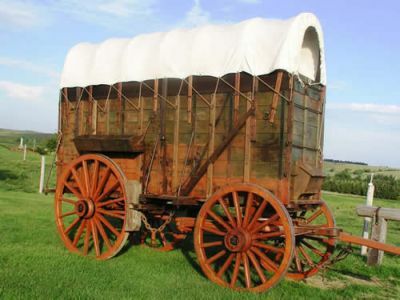 The Oregon Trail was the route west taken by 350,000 to 500,000 men, women and children from the 1840s to the 1860s. While making the trip almost 10% of the people died from diseases spread by poor sanitation. Travelers packed wagons as light as possible, only taking easily preserved staple foods. Most meals consisted of bacon, beans, coffee, biscuits and bread. Although some people tried to carry along furniture, books, and treasured belongings, as the journey progressed, many pioneers had to throw away extra baggage to avoid overworking the oxen. The 2,000 mile journey took five months by ox-drawn wagon. Today, you could take the same trip 2,000 mile trip on the Oregon Trail by car in 4 days or on a airplane in 4 hours. Are you a Facebook User? Join “The Promise” on Facebook! 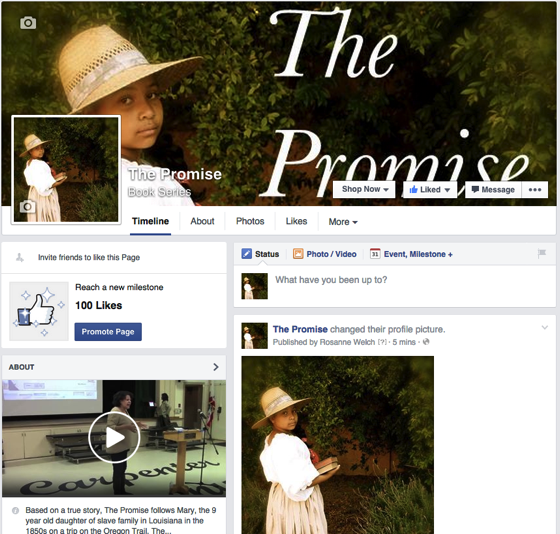 Join “The Promise” on Facebook! 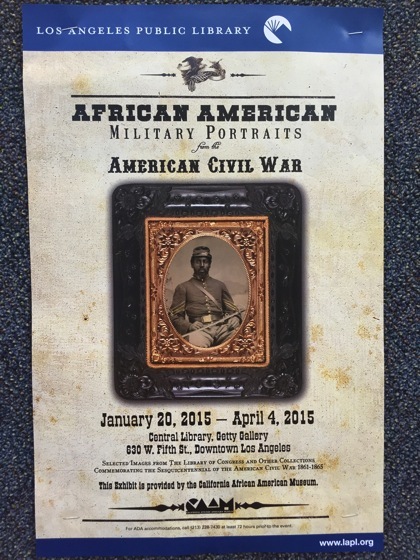 Please join Dr. Rosanne Welch and Dawn Comer Jefferson for Literacy Day at the California African American Museum. We will be doing a workshop for kids as well as readings from our book, The Promise. Signed copies of The Promise will also be available for purchase. The day includes several local authors offering writing workshops and book signings, celebrities reading books, art and crafts, book giveaways and music. And there will be a lunch truck on the premises. 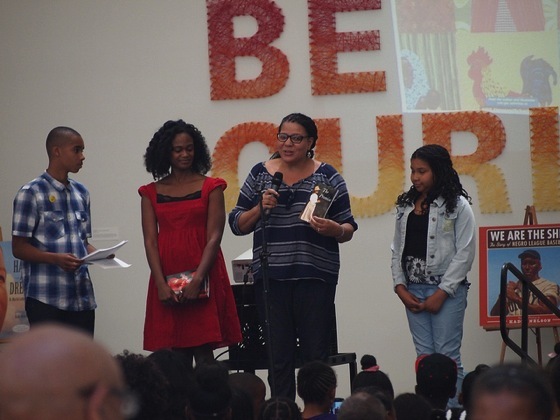 Since 2004, in celebration of National Children’s Book Week, we present local Los Angelels authors and celebrity readeres in CAAM’s galleries. The activities of the day also include an arts and crafts workshop, literacy workshops, face-painting, and book giveaways for families in attendance. Hiram Young – Black Entrepreneur and U.S. western expansion from Jackson County Historical Societ on Vimeo. We came across this flyer on one of our regular visits to the local library. Quite a few of the images are available online. 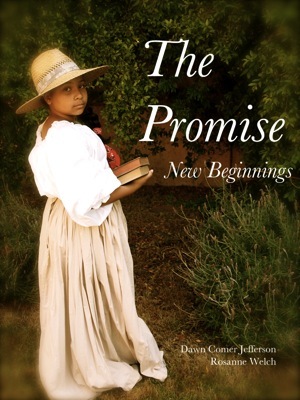 As part of African-American History Month, we’ll be linking to a series of true stories that also involve the Oregon Trail and the American West like the characters in The Promise. Reuben Shipley was brought to Oregon as a slave in 1853 by his white owner, Robert Shipley, over the Oregon Trail from Miller County, Missouri. The white Shipley—my distant ancestor—had promised the black Shipley that if he helped him start his farm in Oregon, he would give him his freedom. A painful choice confronted Reuben Shipley. In exchange for the prospect of being free, he faced leaving behind his wife and two sons, who belonged to other slaveholders. But if he decided to remain in Missouri near his family, he would be sold as a slave to another owner. Reuben Shipley was taken to Oregon, a six-month trip of 2,000 miles. According to the family genealogy, he resolved that once free, he would save enough money to buy his family’s freedom in Missouri and bring them to Oregon. He never saw them again. Shipley, who did get his freedom, was by no means alone as a slave brought to Oregon. I was to learn over the next several years that there were as many as 50 slaves who came with early settlers, most of them from Missouri. Some were released soon after they arrived; others kept much longer. Yes, the number is miniscule compared with the 115,000 slaves in Missouri in 1860, and the four million slaves nationwide. But a slave is a slave. And this was Oregon, a free state which admitted to the Union in 1859, and a solidly blue state today, jokingly referred to as part of the nation’s “Left Coast,’’ along with Washington and California. Sources: Greg Nokes, Breaking Chains: Slavery on Trial in the Oregon Territory (Corvallis: Oregon State University Press, 2013); Quintard Taylor, “Slaves and Free Men: Blacks in the Oregon Country, 1840-1860,” Oregon Historical Quarterly 83:2 (Summer 1982). A friend, fellow blogger and great photographer, of my husband Douglas, Mike McBride was driving across America this summer and posted these shots along the Oregon Trail. You can find more scenic photographs by Mike using the links below. 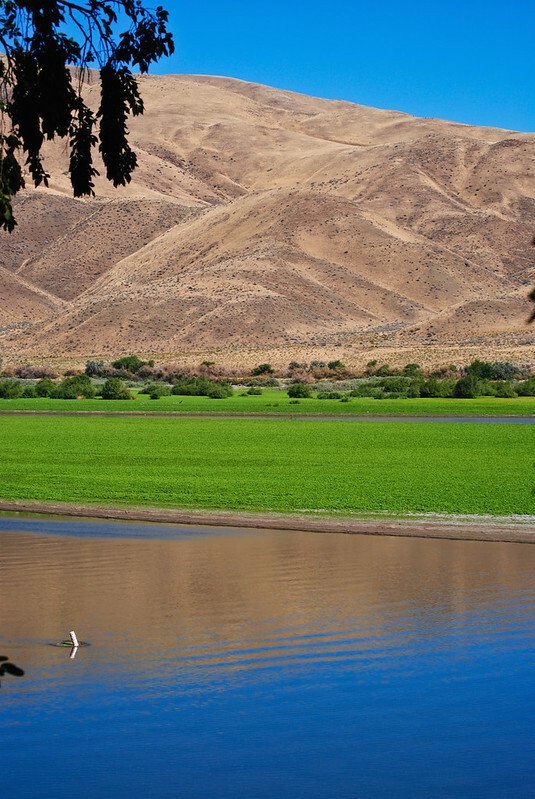 Just one of the many scenes along the 2,000 mile Oregon Trail. 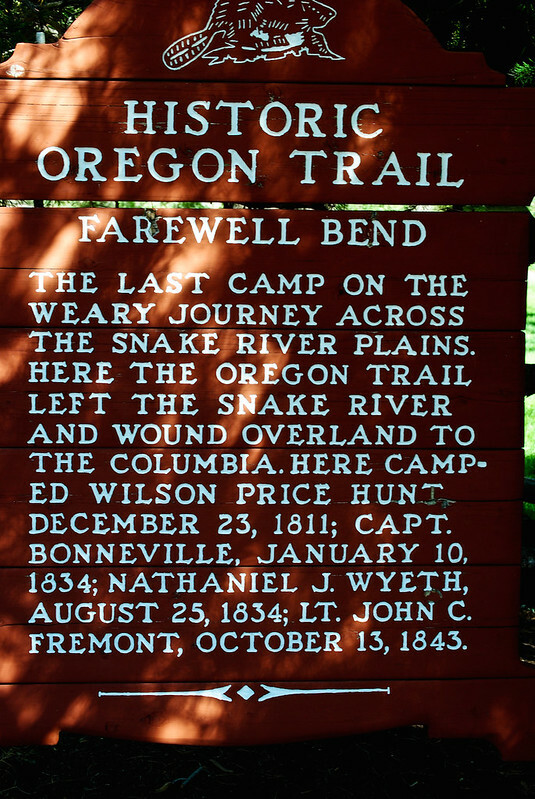 After following the Snake River for 330 miles, Oregon Trail pioneers rested above the bend in the river here, then bid farewell to the Snake River and continued their trek. Look for a small iron cross, visible from U.S. 30, that marks the location where the Snake River Shoshone Indians battled with pioneer travelers in 1860. Restored covered wagons rest at the park entrance and next to the Oregon Trail kiosk. You can also visit the National Historic Oregon Trail Interpretive Center on Flagstaff Hill just east of Baker City, no more than an hour’s drive away.